The closer we get to announcement date of Sandy Bridge-E (SB-E), the more information we gather about it. 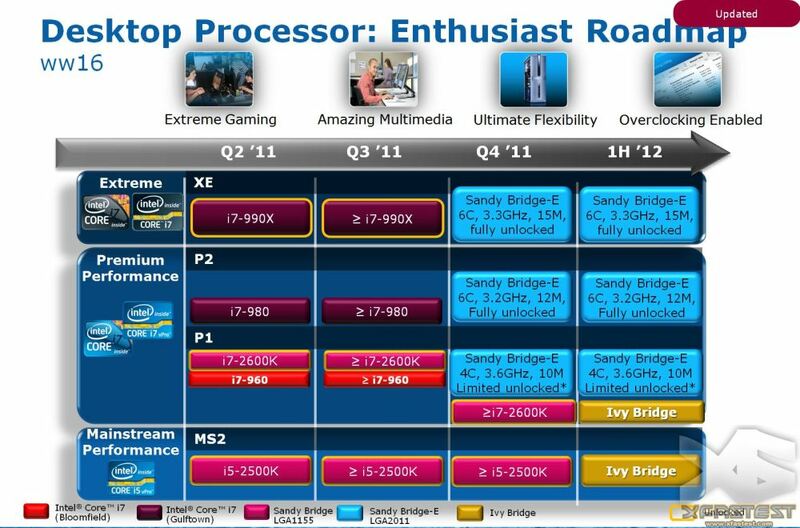 Follow the fresh roadmap from Intel we get a clear picture of specs for several SB-E processors of High-end and Mid-end segments. Note that the naming of these models is not disclosed. As you might notice, amount of L3 cache effects price too. Another thing to note is that first two models are marked as “Fully unlocked” which makes them more attractive for overclocking. However, the third model is only “Limited Unlocked”. It appears that either CPU multiplier or BCLK can be locked for that model. Just to remind you, SB-E processors will have Socket LGA 2011, quad-channel integrated memory controller and PCI-Express controller featuring up-to 40 lanes. Same time new CPU presented, Intel debuts X79 Express chipset that will provide ten SATA 3 ports and DMI 2.0 interface. Yet another peculiarity about Intel Sandy Bridge-E processors has been spotted by Bright Side Of News source. 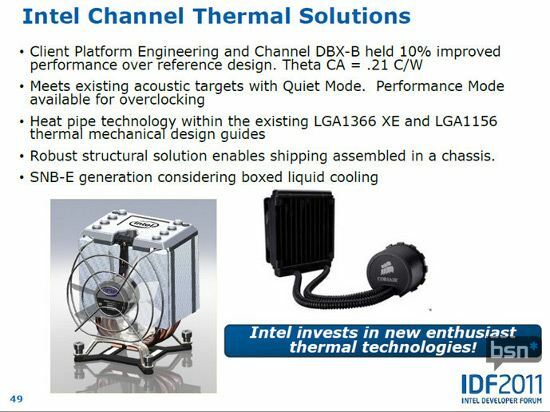 According to one of the slides from recently held IDF 2011 session in Beijing Intel considers the possibility to supply Sandy Bridge-E CPUs with liquidcooling systems. Intel specified Corsair H50 cooling system, designed and developed by Asetek, as a possible cooling solution for its newest CPUs. Of course this will have good impact on price and coupled with high cost of processor itself can results in kind a frightening figures for end-users. On the other hand, WC is more efficient way of cooling that provides more room for enthusiastic actions, overclocking that is. Therefore, a combination of High-end CPU and highly-efficient WC system will surely attract lots of hardware enthusiasts that wish to have only the best components to reach new performance heights. Besides, this step can become damascene moment for liquidcooling system manufacturers.